College is super busy and by busy I mean that when I’m not studying, my time is consumed by playing the Wii. This is extra hard when I have Lego Wii Star Wars and a boyfriend that is holding himself hostage in my room until he beats the game. But I don’t have a single complaint about my current state of living. Although most of my life has been consumed by meaningless wastes of time, I have had the opportunities to do some pretty cool thing the past month. Aside from the boring everyday school work, I have been branching myself out and trying some new things. If you’ve kept up with my life thus far, you know that I am a writer for Her Campus UCF. This was something that I dipped my toes into at first and now I’m jumping in head first and nothing but good has come from it. I have written in new genres about topics that I haven’t approached before and the feedback I have been receiving has been so heartwarming. I started out strong with my first article written being recognized by nationals and getting over 500 views. It was an amazing start to the semester and I was rewarded the title of the first Writer of the Week. Such a huge honor as a freshman who wasn’t sure how well she’d fit in with a bunch of English and Journalism majors. My other articles since then have also received positive comments from all my peers. I even rocked the boat and wrote one about politics, something I never want to talk about. Yet it worked in my favor and was also recognized by nationals so that was a huge confidence booster. Her Campus has provided me with a great experience so far and I can’t wait to see what the future holds in the organization. I also *finally* got a job. Which is a blessing because money is hard and I just want to buy ALL the things and eat ALL the food but my wallet never seems to agree with me. Not cool. But now that I have a job, that blessed $8.25 and hour will be treating me well as I venture into the holiday season. (Sidenote: I love buying people things, but my expensive taste is going to kill me I swear. But it’s okay because everyone deserves happiness in the form of entertainment tickets and memorable jewelry.) I started my job last week at the bookstore because I am a basic college student just trying to live a little. It’s a change from my usual food & beverage positions but I’m hopeful that I can get cross trained in the cafe so I can start whipping up fancy beverages sometime soon. As you know, Orlando is full of amazing experiences and I am lucky to be able to participate in these events whenever I want. 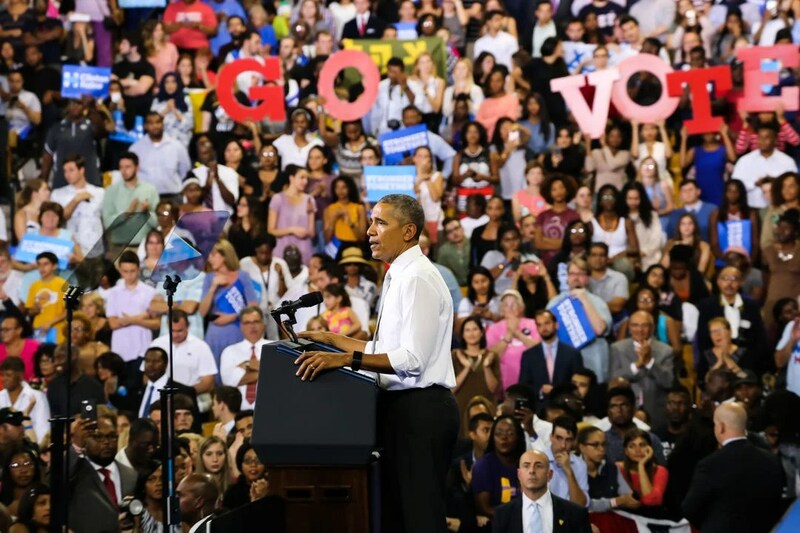 Two weeks ago, UCF was lucky enough to host President Obama as he campaigned for Hillary Clinton in the past election. My friends and I waited in line for over nine hours to see him because how often does one get the experience to hear the current president speak while he is still in office? It was an amazing experience and I’m so glad I had the opportunity to see such a powerful man speak. I promise I don’t spend all my free time at Disney World, but I do spend a lot of time at concerts. Last week I got to see my favorite band to dance to, Fitz & the Tantrums for a second time. (You can read about the amazinginess that was the first time here.) It was a totally different experience with totally different people, but I lost my voice during the first song and continued to dance and clap the night away. If you ever have the chance to see them, please for the love of god go. On a more financially savey account, I was able to go to the FREE Orlando Pride day festivities last weekend with friends. I have always wanted to go to a pride festival and this was the perfect first experience. It took place in downtown Orlando around Lake Eola and it was a gorgeous event. It was so humbling to see all the support from the LGBTQ+ community and all the allies. The heart size in Orlando was so huge and to see all the support from the community following this summer’s Pulse tragedy was incredible. The parade itself lasted almost two hours thanks to all the companies who put in time and effort into supporting the community. The environment was so uplifting and I am amazed by all the positiveity that surrounded us. 10/10 recommend. So that’s what I have been up to since the last time I updated you guys. The next couple weeks are going to be fun with all the holiday festivities, but also super stressful due to the semester coming to a close and finals beginning. But it’s all alright, every day is a new adventure and I am so fortunate to be on this wild ride.